Joe Smith scorches an out-of-nowhere 10.92 WR for 100 at 58? Paging Willie Gault! If a mark at WMA regionals is to be believed, you have some competition in the over-50 sprints. According to semifinal results Friday, 58-year-old Joseph “Joe” Smith ran the 100 in a wind-legal 10.92 seconds. Say what? That’s a half-second better than the listed M55 world record of 11.44 by that snail of a guy Bill Collins. And his best listed time of 2014 before Friday? Try 12.57 at a mid-June meet in San Mateo. So what gives? He’s primarily a horizontal jumper, whose previous listed dash foray was at 2010 Sacramento nationals. He ran 12.24. So I’m looking for an explanation. He ran on the M55 silver-medal 4×2 team at Budapest worlds this year, but I haven’t been aware of his world-beating speed until now. If accurate, this is the oldest sub-11 sprinter in history and a massive WR improvement in M55. Ken, I am so glad that the wind reading has finally been posted: a favorable “breeze” of 0.1 meters per second. After posting yesterday I wondered whether there was a gale-force wind that had helped the runners, but even that would have not brought someone down to 10.92 seconds, in my opinion. With “Smith” being the most common last name in the U.S. one has to wonder if this is the same Joe Smith you describe above. If it is, this time is essentially impossible. If not, it’s almost impossible. After all, over the years we have seen a host of great sprinters — Payton Jordan, Steve Robbins, Stan Whitley, Bill Collins, Oscar Peyton, Steve Peters, etc., etc. — move through the M55 division, and none of them even came close to 11 seconds. Why would Joseph Smith run under 11 in Costa Rica? As noted yesterday, Ken, Wayne Marcano also broke the world record in Costa Rica by running 11.41. What’s going on? Running at altitude? Not nearly enough, one would think. Also as observed yesterday, Ivan Black’s winning time in the 2000-meter steeplechase was 30 minutes, 59.22 seconds, even though he ran 10:15.95 at Winston-Salem in the same event. I wonder what happened there. Note that everyone else in Black’s race also ran over 30 minutes in a race of just under 1.25 miles. I believe I photographed Joe Smith in that semi-final. I remember being astounded when I saw M55 on his bib because the guy was FAST, but I don’t believe record-setting fast. Will try to dig through my files later today to identify him. Ivan Black, whose photos I sent you running the steeplechase and accepting his gold for that event, told me he was trying to get to the bottom of his posted time (which clearly was wrong). I will see Ivan today and ask what he found out. Good work, Rob. We will wait to hear more on this. One wonders again whether this is the same Joe Smith, as that Joe Smith ran 12.57 in June of this year. How he could get down to 10.92 in 2 months is beyond comprehension, albeit technically not impossible. Either it’s not Joe Smith or the time is wrong. It’s impossible. The gap between his time and all his other times, not to mention all the other top sprinters, makes no sense. He also ran a 56s 400m, which is really too slow for a 10.9 100m. So I don’t know what actually happened, but what did NOT happen was Joe Smith M58 running 10.9s. Be realistic, how is it possible the top 3 times in the world this year including a huge world record were all accomplished in the same meet in the same heat? That was the fastest prelim time in ALL age groups. Seems unlikely. I’ve seen timing errors in meets many times. 2:04.02 age 38- 1:55.91 age 46! 2006 at the NCCWMA he ran a 2:04. Results are scarce for him. I did find a 4:11.4 1500 at Worlds in 2011. What is the secret to dropping over 8 seconds in 8 years? Joe Smith emerged as a narrow winner (by 0.11 seconds) in 12.43, with Luis Huarcaya of Oregon (representing Peru) second in 12.54. Edwin Plaza was third in 12.57, and Wayne Marcano, who broke the world record yesterday with 11.41, was fourth in 13.04. Looks like Wayne should have saved his energy for the finals, as his time increased by 1.63 seconds from trial to final. As for Joe Smith, he must have gone all out in the trials to run 10.92, but one wonders why he required 12.43 seconds today to prevail narrowly over Luis Huarcaya. My best guess is that he did not actually run 10.92 yesterday. Surely he was running all out today to keep Huarcaya at bay. Well, shades of Albuquerque in 2011. Do we throw out all winning times in the 100 meters? I’d believe 11.92. I think there is some sort of timing error. I’d like to see some video of these races. Madrigal-improving in the 800 of 8 seconds is unheard of at that age. I don’t think there is another case of a runner out there who has done that in recent history. Certainly not when you are talking sub 2. Curious to see how he runs the 1500, with that speed he should run 4:05 easy. I looked into this today and found out there was a power outage for a while yesterday and hand timing was done on an undetermined number of 100 meter semi–final races. Officials are looking into this further. That is all anyone would tell me. Also, Ivan Black told me his time clearly was miscalculated in the steeplechase. His Gold Medal is safe, but he is looking to have some sort of correction or notation made to the listed time. No complaints of timing errors today, as far as I know. I should also say that the timing glitch in the steeplechase also occurred during the power outage. Rob: You continue to be our best investigative reporter down in Costa Rica, and here I thought you limited yourself to photography. If you look at the results from yesterday’s semifinals (59 for men, 10 for women) you will see that all 69 times appear to be FAT (they have two digits after the decimal point). Based on your report it looks like they were hand timing some of the races and then listing them in a way to indicate they were FAT. Hmmm…. Here’s a question for today, Rob. Take a look at the results for the M45 100 and tell me what seems fishy. Any reason why they hand-timed this race and then presented the results as FAT? As a mathematician, you know that the chance of getting the same last digit 4 times in a row when there are 10 possible last digits is 1 in 10,000. Can you check this one for me? Also, Joe Smith won the M55 100 meters today with more credible time of 12.43. You have eagle eyes, Pete. The reason we don’t notice those things here is that the results are not posted on the Jumbotron, so we can’t immediately see strange patterns like the one you point out. We have to wait to see paper-posted results or until they are posted on the web. Since there is no WIFI at the stadium, life at the stadium has moved on to other events before anyone can look at the results as closely as you can. I’ll see what I can find out, but I may end up swimming with the fishes if I do. I got a lot of “don’t quote me”‘s when I found out about the power outage and hand timing. You’re a wild and crazy guy, Rob (“swimming with the fishes”). I understand the desire to create what looks like a FAT result for every runner in every race, but yesterday (in the steeplechase and 100 semifinals) it seems that this was taken to an extreme. Oh, well, I will be quiet and wait to see what comes out of all this. Maybe there will even be an official investigation of sorts. Whenever a sprinter in any age group sheds more than .5 (half second) off their best 100 meter time within a one year span, there is reason for concern. 2.5 seconds under your norm is next to impossible (even with a hurricane at your back). When you see multiple runners around 2 seconds under there best time in the last couple of years, you know something is very wrong. I know sometimes things just happen, but it’s sad that people spend good money to go to these international meets and the timing system doesn’t even work. Looking at the HJ sheet M55/59 and the end results I see some flaws. I for one go to the international meets to compete.against people I rarely see or I have never heard of. The timing issues will be sorted out. After my 400 win people, kept asking about my time. My response — No importa. I knew I won and that is all that I really cared about. I wish everything could always be perfect but I learned long ago that things sometimes go wrong and you move on. I am looking forward to running with my teammates in the 4×400 tomorrow and I hope that we represent US by competing well. maybe…hmm?… it make sense or not…? As long as the 10.92 does not become a record it is OK. Otherwise a generation of runners might be trying to beat it. It really would not be fair.. It looks like something was definitely wrong with the timing in this race. 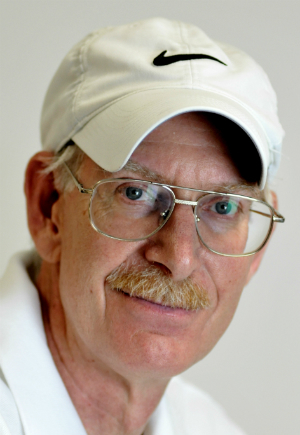 We know that Bill Collins frequently wins races with daylight between he and the next runners. So for two people with no similar results to break his record in the same race and a third just off the record is just beyond possibility. I hoped this is checked out to verify. How about some coverage of the meet instead of obsessing over this? Don’t worry everyone, the rankings lists will be corrected as soon as I get and upload corrected results. I thought you all would appreciate having these results (and EVACS) posted quickly so I’ve been converting each at the end of the competition day. Results for NCCWMA are here: http://www.mastersathletics.co/meetresults.php?season=Outdoor&year=2014&meetno=5258 and EVACS are http://www.mastersathletics.co/meetresults.php?season=Outdoor&year=2014&meetno=5257 I am hopeful I will get the complete meet results to reinsert so the rankings lists are accurate. Terry, if you don’t like the conversation, you don’t have to visit. Some of us like to run for time and not place. Every time in the M55 100 is off by more than a second. The entire heat needs to be omitted from record books as does the majority of the meet. Placings are fine b/c everyone worked hard to get there and compete so they deserve to be rewarded but there should not be any records given from this meet. That’s a huge change, Matt, and the new time for Madrigal of 2:04.36 is much more compatible with his 4:16.37 for 1500 later in the meet. I’m glad the meet organizers were willing to make this correction (8.45 seconds in a 2-lap race is very large indeed). Note that I now believe that Derek Pye did run 11.20 and Don Drummond did run 11.70 for the M45 100 final. They’re both great guys and, like Thad Wilson, terrific examples of the hurdler-sprinter prototype. At first I thought these were hand times, but apparently not. As for the big question of whether Joe Smith really did run 10.92 and Wayne Marcano truly blazed an 11.41 in the M55 100 trials, I guess the resolution is that they did run those times. Why? Pretty simple — the meet has been over for more than 48 hours, times in the steeplechase and the M45 800 were changed, but the prelim times for Smith and Marcano have stayed the same. Both are world records (world mark is 11.44 by Bill Collins). The Joseph Smith you speak of is most commonly known as Jay Smith to those of us who know him. Jay is NOT a horizontal jumper. Jay normally competes at 400/200 meters. We are just shy of beating this thing to death, but a look at seed times and final times seems to show life is as it should be for the M55 100 in Costa Rica. Its just the prelim/semi times that are an anomaly and should be thrown out of the rankings and record consideration on the grounds of improbability. According to the 100 metre wind/altitude adjustment chart,it would take a gale force head wind of -11.3 to slow down a 10.92 sprinter to 12.43. The wind is listed at -0.4 for that final. Freddy Madrigal went from 1:55.91 in the 800 all the way up to 2:04.36. Ivan Black went from 30:59.22 in the steeplechase to 10:45.8. Everyone else in Ivan’s race also saw a huge drop in his listed time. The times of Joe Smith and Wayne Marcano (as noted above) have risen dramatically. Are all of the remaining times for this meet correct, or are there some erroneous times that have just not been caught? We may never know. Is someone connected to the Costa Rica meet monitoring masterstrack.com, noting the issues raised, and then asking someone in authority to review the events at issue? Due to the numerous errors discovered in our results, we performed a 100% audit of the posted times, heights, and distances and made corrections as appropriate. Of course, I would like to see that statement only if they did a complete audit. First off – congrats to Mr. Smith – nobody is questioning anything you did -it’s just the timing issue from the two M55 heats (and the 800/2000 times) that puts the other results in question. Its interesting that both M55 prelims are now (Thurs am) all hand times. According to the US Masters Rankings – J. Smith the 2/4 guy, is listed as 55 years old. 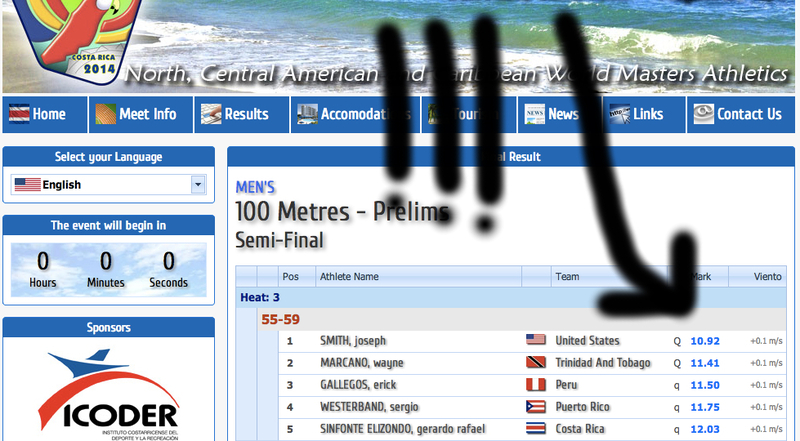 Joseph Smith, the Gold Medalist from Costa Rica, is listed as M58 and seems to have been the horizontal jumper Ken originally mentioned (his last sprint mark being Sacramento). So two different guys. To confuse the issue, if you switch to the World Masters Rankings there is also a Joseph Smith from Great Britain, age 55 – whose times and meets seem to be the same as J. (or Jay) Smith, so probably the same guy. Congratulations to all of the medalists as well as those who competed their best. It’s unfortunate that with so many timing errors the track results cannot be assumed to be accurate. I for one would vote on not uploading these track results into the masters ranking site due to these errors. I think the results were all corrected on the meet result website so I deleted and reinserted all the results into the rankings including preliminaries and multi-event. Please let me know if you see any errors. See them here: http://www.mastersathletics.co/meetresults.php?season=Outdoor&year=2014&meetno=5258. My main concern, John, as noted earlier, is the possibility of additional errors. I looked at some of the results, but for the most part I did not recognize the competitors. I can offer nothing in terms of whether the marks are correct. Ivan Black (M65) ran 10:15.95 in the steeplechase at Winston-Salem and perhaps was hoping to better that in Costa Rica. Ivan was initially given a time of 30:59.22, which has now been changed to 10:45.8. I don’t see how anyone can examine a photo of someone who has run a race in 10 to 11 minutes and decide that the time was 30:59.22. I simply can’t figure out how that happened, and the error was compounded by giving everyone else a time of over 30 minutes. I can understand an error of 0.01 or 0.02 seconds, but I can’t deal with errors on the order of 20 minutes. Such mistakes cause me to lose faith. A second example is Freddy Madrigal, who was said to have run 1:55.91 in the 800 (M45). Our sharp-eyed Matt B. (post 8) noticed the error, and 3 days later Matt (post 30) announced there had been a change to 2:04.36. This is unfathomable. How could someone look at a photo indicating a time of 2:04.36 and read it as 1:55.91? This kind of error is unthinkable, esssentially unprecedented in my experience, and reflects very poorly on the meet. I won’t even touch the issue of how someone can run in the 12s for the 100 and be given a time of 10.92. Who was the photo evaluator? Thank you Peter. I was told “The results are being corrected” by someone involved with the meet. I think the corrections were made and, as always, want to see if I made any mistakes in the conversion. Thank you, John. This is a major step of which I was unaware: “The results are being corrected.” If there has been a 100% audit (see post 37 above) I believe we can now accept the marks currently shown. I am looking for this runner Joseph Smith. He is an old friend and I was hoping to introduce him to a child who needs some inspiration in Track and Field. Please if anyone knows him send my email address to him to contact me.